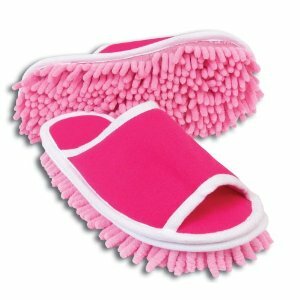 slipper genies, but unless I did some really sloppy-legged walking, I was really just re-distributing my dust, lint, hair and dead skin particles and mixing them in with the green-ness. 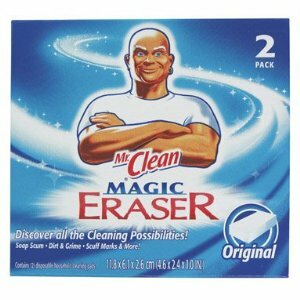 Thought I’d also try the “magic” erasers some of my friends have been raving about. What the hell are these things made of and what’s so magical about them? My magic eraser is always too small, tends to fold under pressure, or it does the same thing my erasers did in elementary school: tears the paper. I ended up giving the RoboMaid a whirl. 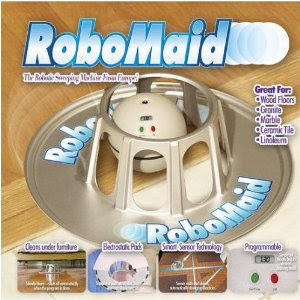 It sweeps any floor surface, and the robotic ball in the center is kind of cool, but my RoboMaid had a nasty habit of going into rotating mode and cleaning the same area over and over while completely neglecting others. Think I’m going to make the dog wear the genie slippers while she herds the RoboMaid around, and hope for the best. I’m married to one of those men who watch too much television in general, and way too much fishing television in particular. I long ago stopped feigning even a mild interest in watching men hyperventilate and/or overreact over the simple act of catching a fish, which just doesn’t seem to hold nearly the mystery and allure for some of us that it does for others (and we’re not really sorry that we don’t share the love). Anyway, the other day one of the fishing shows took a commercial break. I was reading and trying not to listen, but you know how the volume tends to go up when it’s commercial time, so that even if you’ve gone into the other room you don’t miss the sales pitch. It was an ad for Duck Hunter, an indoor hunting game. A father and son were shown enjoying themselves, their “camo” clothing matching the upholstery and curtains in their house, à la Sound of Music, as they gleefully shot infrared beams at the fake duck, which flapped its fake wings and flew around the house, carefully navigating objects like ceiling lights. Tell me this is how it would play out at your place, where there are clearly no impediments to indoor flight by an blind winged item that’s tossed randomly into the air. 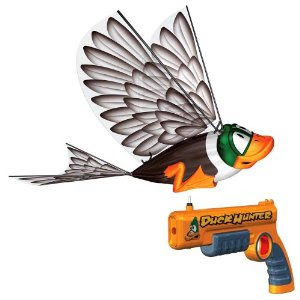 Meanwhile, it takes three successful shots to kill the duck, or stop its flight, so you’ve gotta work to take him down. Indoor hunting games…almost as fun as indoor motocross and at a fraction of the cost. I might even get my guy the extreme indoor/outdoor version. Imagine, his playing outside! Really, though, it’s a terrible feeling, isn’t it? Very difficult to get over. Not much you can do about it, either, and I don’t know about you, but I’m never fond of chalking things up to experience, living and learning, or allowing someone to get away with my money scot-free. Plus, there are all those moments of hindsight, of fervently wishing you’d seen through this person who really didn’t seem very trustworthy at the time, of angrily thinking of what you’d like to do to him/her should your paths ever cross again. But they won’t. In my admittedly limited life experience, revenge has a nasty way of backfiring in unpleasant ways. However, unpardonable actions demand some sort of response beyond remorse and rumination. I’m recovering from a recent encounter with a con man, and opting for some preventive maintenance, trying to learn as much as possible as I can about the various ways in which people can, and will gladly, take advantage of me. So many ways, when you start doing a little research, it’s really quite overwhelming! 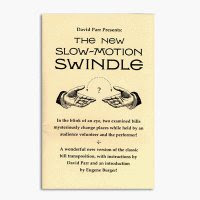 I’m starting my lessons with the slow-motion swindle, which may seem old-fashioned, since many of us no longer carry cash or allow others’ hands to touch ours. So I’m also getting this book, which is going to teach me how to cheat at everything. Everything!! In a few weeks I’ll be able to say, “This will never happen to me again,” although I’m not sure I’ll ever really believe it. Been noticing America’s widespread love affair with cake? Seems like every couple of weeks a new television show about cake decorating appears, or a new cake blog or book comes out. And have you checked out the cake decorating section of your grocery store lately? (okay, me neither) In any case, cake is riding the fad tide, hanging out with the popular crowd and loving every minute of it. However, there are still those of us living our lives largely without the involvement or assistance of cake; our face time with this dessert is usually and purposefully limited to one or two occurrences per year. I’m firmly in the “who’s eating all this cake?” camp, unable to comprehend the hoopla and frenzy. On the rare occasions that I make a cake at home, if both circles line up properly that’s a big deal. If there ends up being enough icing to cover all the cake without any show-through I’ve hit the heights. Didn’t your mom tell you not to play with your food? I just can’t get into this as an activity, but I don’t want to seem cake-uncool. My way of coming to terms with this development: cake kits! They give me what my cakes lack: dimension, color, motion, and the appearance of being inedible. Then everyone’s happy. Meanwhile, I’m participating in a fad, and therefore vicariously acquire a sense of validation that often lasts for hours. 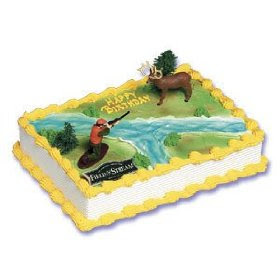 Best of all, now there are masculine-themed cake kits, because this craze isn’t just for the ladies. Here’s a perfect example. 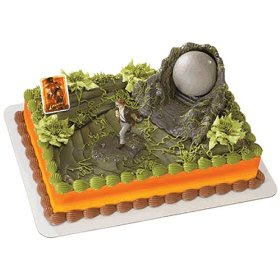 This Indiana Jones cake topper kit really makes my mouth water. And if I hit a lever, that big round boulder will roll across the cake! How cake-tastic can you get? Men love this. They also like the deer hunter cake kit, largely because they get to keep the plastic dolls. Er, action figures. For that very special someone, we offer the Spiderman Classic Spin and Kick. You get a button to push (remotely! 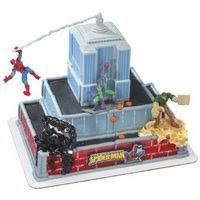 ), which makes Spiderman whirl around the building, often with enough speed to blow out birthday candles. The manufacturer has even thrown in some “sugar srinkles,” which really set off any cake. It’s great to be alive during times like this! Not sure if it’s the economy, my rapidly aging brain and body, or over-exposure to dry, heated air, but I’ve really been stressed out lately, feeling like the weight of my little slice of the world has become much heavier than usual, and as though the effort to counter this with any kind of vivacity or élan isn’t going to be happening soon, or meeting with much success. I’ll also be the first person to admit that February is my least favorite time of year, a month I like to think got designated shortest because of its surly and boorish unpleasantness and our desire to get it out of the way as quickly as possible. In any case, there I was at the store, spending money I don’t have now and possibly never will, desperate to rid myself of this disagreeable contentiousness. And there as always, waiting for me, was a proposed solution, this time in the form of a bottle of roll-on stress relief lotion, which relaxes your mind and body simultaneously. I found the concept of mental and physical relaxation combined so highly appealing that I rushed home and freely applied this product to most of my bodily surfaces. I suggest you not follow my lead, because stinging regret showed up and in the end I would not have used the words “stress free” to describe myself. As usual. Turns out my problem was that I was craving a lack of stress. A quick once-over with some quit craving lotion brought about at least a modicum of relief.